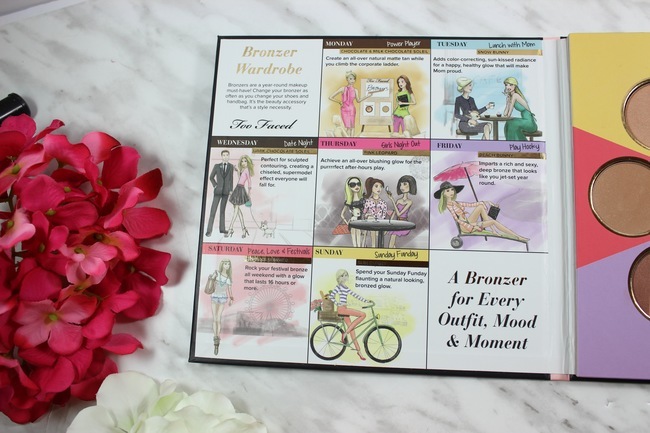 Too Faced is known for their bronzers and their vast selection of them. 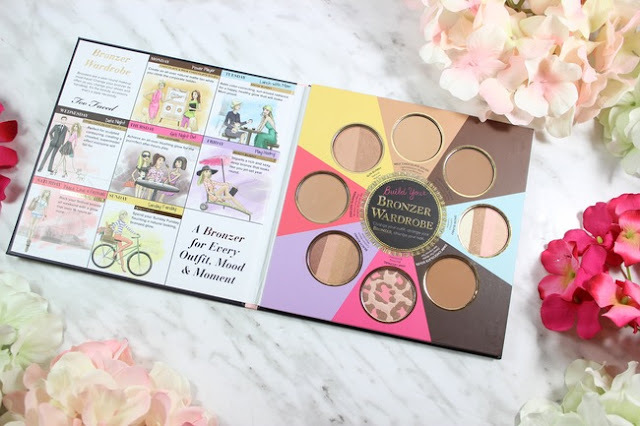 Their Little Black Book Bronzers features their complete collection of bronzers so you don't have to choose just one to try out, you can try them all. Best of all they are all permeant selections, so if you fall in love with one (or two, of all of them), you can go an buy a full sized. It basically a great way to try a bunch of bronzers out without guilt and get yourself a full bronzer wardrobe without the full commitment. Each bronzer comes in a smaller format, hence the "little" in the palettes name, but all are a great size if you ask me, plus there are 8 in it. This is a classic bronzer and probably the most famous in the set. It is a matte bronzer that contains cocoa powder and it actually smells like chocolate! I like this one for contouring since it is matte and blends so well. Just like the Chocolate Soeil, it contains cocoa powder and is matte, but it is lighter. Because I am so fair I love this one for my everyday bronzing needs. just like the other Soleils this one is gorgeous, smells like cocoa and is matte, but it is deeper. While I am definitely too pale of a gal to pull this one off on a daily bases I have used it a bit lightly mixed with the Chocolate Soleil when I contour and have really found it is a great blendable bronzer. This is a bronzer that I consider also a blush. It has 4 stripes on it, two bronzer shades, one pinker and one that is a highlighter. It isn't easy to just select just one so your best bet is to just blend them all together for a luminous bronzer-blush shade. This bronzer features 3 shades in a leopard spotted design in it. When swished it all together you get bronzer that is glowy and stunning. It has a lot more pink shades in it, which is why it is a great blush for the fairer and a great illuminator for those with darker skin tones. Just like Snow bunny this is a striped bronzer. This features 4 stripes of bronzy and glowy shades that can be blended together to make luminous glow bronzer. Since it doesn't have the pink shade in it like Snow Bunny you can wear it just as a bronzer or as a bronzer blush. This one should last you 16+ hours (hence the endless part of its name), it also has a pretty nice glow to it. Featuring two shades this laminating bronzer has a pretty pink undertone that gives you a bit of a flushed look to your face. You can mix and blend the shades to make it lighter or darker depending on your needs/wants. So there you go, Too Faced Little Black Book of Bronzers, a palette that is super cute filled with 8 great bronzers for what every your needs or moods are. I love this set because I am not the biggest bronzer user, so a full sized of any of these would never get used up, so now I can indulge in a bunch of different choices without guilt of having 8 full sized hanging around. You can pick it up at TooFaced.com. * This product was sent for me to review; all views and opinions are my own.